Q: When and how did you fall in love with seaweed? A: In 2009 I was training to become a docent for the Duxbury Reef, the gorgeous tidepools near Bolinas CA, and everyone was looking at and learning about the invertebrates—the starfish and anemones and nudibranchs. Nobody seemed to be noticing the seaweed all around us. I took a seaweed scrap and held it to the sky. I was mesmerized by the color and form. I knew I had to get some seaweeds onto my scanner to experiment with capturing that color and form. I was working on a book titled Beach: A Book of Treasure. When that was delivered to the publisher I immediately started working on a book exclusively about seaweed. Q: What’s your favorite seaweed photo? Why is it your favorite? 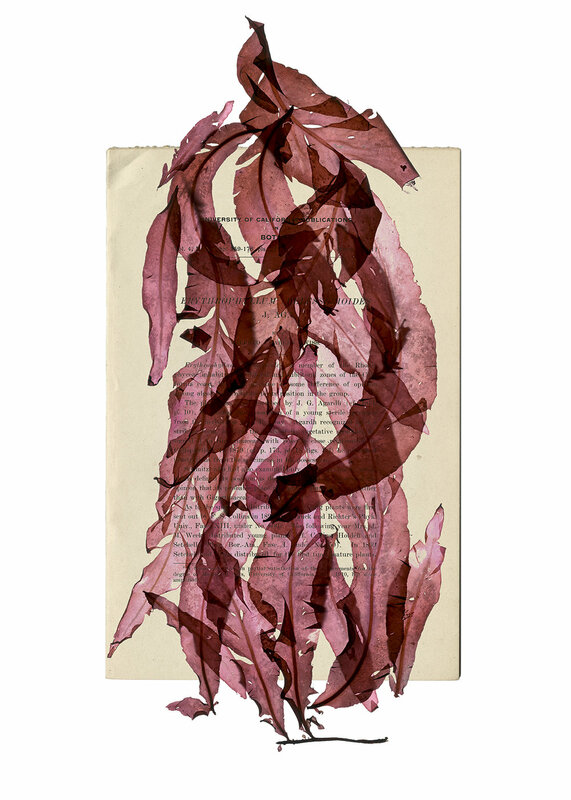 A: My favorite seaweed photo is usually the last one I made. I made this image last week! It is of the beautiful, rosy-red Erythrophyllum, or feather weed, layered on top of a publication written in 1911 by a woman named Wilfred Charles Twiss. I have an ongoing series of layered images bringing the history of who studied the weeds into the image of the seaweed itself. I don’t know much about Wilfred Twiss, except that she got her masters degree from UC Berkeley in 1910, studying and writing about the life cycle of Erythrophyllum. There are a lot of great women scientists associated with the study of seaweeds. Their stories are fabulous. Q: Tell us about your book, An Ocean Garden: The Secret Life of Seaweed. A: This little book is a visual primer on the science and art of seaweed. I consider the images portraits of sorts. The text explains how seaweeds succeed in their niche in the ocean ecosystems along our shores. Marine Algae (seaweed) are vitally important to the health of the oceans and need our considered regard to remain robust as the oceans warm and come under siege. I have a new project coming. It takes a deeper dive into the stories of sixteen iconic Pacific Coast seaweeds and kelps. Keep your eyes peeled! Q: Your beautiful artwork decorates our packaging, what is unique about this collaboration to you? A: Besides being a firm believer in the product itself—I use the Samudra face cream every day and adore to shampoo with the body bar—it is important to highlight businesses that have the right ethos behind them regarding ocean health and policies. Samudra really walks the walk and I look to its founder, Shilpi, as a mentor of sorts in taking the right steps towards healthier oceans. My seaweeds on the packaging are a vibrant shout-out to ocean fabulousness. I’ve been drawn to the ocean for as long as I can remember, where the seaweeds of our California coast blossomed into a lifelong passion. As a designer and author, I focus on using a combination of art and science to explore the water’s edge as a place of self-discovery and portal to our blue planet. Samudra's clear concern for the wild and unfettered health of the spectacular and essential marine organisms in our ocean is an inspiration to me. My artwork adorns Samudra's packaging and I am delighted to represent this dynamic venture and help it grow as an example of how to do business right. Favorite Samudra product: Face Cream. As one watching wrinkles evolve, I have tried many face creams and this one truly is above and beyond.